The big story around here is the weather. It’s been hot. For the past several days it has felt a lot like summer (minus the stifling humidity). Yesterday’s high temperature of 32C (90F) set a new Liuzhou record for the date. It was a little cooler today (27C) but compared to the average February high of 50F (10C) it’s really been quite amazing. 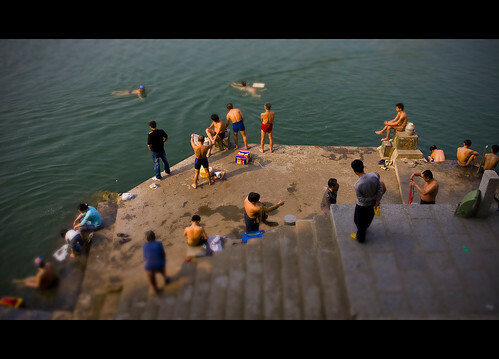 Liuzhou locals swim in the Liujiang River all year long but the record heat has brought folks out in huge numbers. There is nothing quite like the site of a bunch of middle-aged and elderly men in really tight swimwear. I can report that the water is definitely still cold. My eyes are still burning. For the last few days I’ve forced myself to shoot only with the 17 – 40 f4 L lens, trying to get out of my comfort zone and become more familiar with it (I’ve been disappointed). Turns out it may be me, as I am becoming more comfortable but I still can’t seem to find any consistency. I’ve also been experimenting with some tilt-shift effects in Photoshop and quite liking some of what I am getting. You can see a few more tilt-shift photos here. The most interesting character I met today was 74 year old Wei Yao Lu. Here he is, plunging into the Liujiang River for a Valentines Day swim. His clothes and other personal effects are in the metal buoy, which he’ll pull along behind him as he takes his swim. The frail-looking Mr. Wei said he doesn’t swim the river that often during the winter but this year’s warm weather has been too good to pass up. “Swimming is good for my health and will keep me strong” , he said. 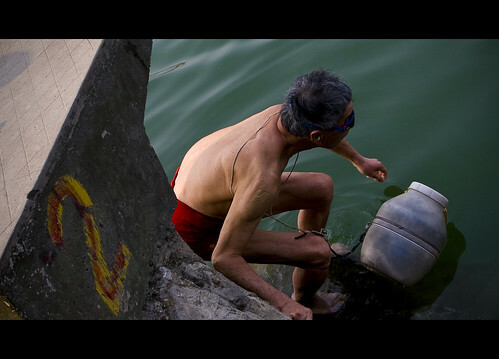 A retired schoolteacher, Mr. Wei has swum in the Liujiang the last 9 days straight and added that he never remembers being able to do that in February. So, one more week until the next semester begins. I have to admit that I am not much looking forward to going back to work. 5 weeks of answering to nobody and making my own schedule might have ruined me. Happy Valentines Day to all of you from your friend in Liuzhou, China. Play your cards right and maybe next year you’ll get to see my Speedo. ~ by Expatriate Games on February 15, 2009. Aaawww come on…you know we want to see your SPEEDO! Your new tilt shifts (sorry, I don’t really know what that means) look awesome though! Cmon’ you guys. Where is your sense of adventure! “Mr. Wei has swum in the Liujiang the last 9 days straight.” Mean feat!! Hasn’t been quite as hot here – only mid-20s. China is a land of contrasts – men in Speedos and women in bathing suits with those little skirts. Ai ya! Nice images. The second one reminds me of the ghats along the Ganges in Varanasi, India. Thanks Craig, India is on my “list”. Funny, I just quoted you in a post I wrote this morning and here you are!